A new study from LinkedIn says Ontario’s software and IT sectors are the most globally connected industries in the province. Almost 35 per cent of connections in the software and IT services sector are international, according to the latest LinkedIn Economic Graph Project, which was put together in partnership with the Ontario Ministry of International Trade. In addition, the report shows that global connections in the IT services sector spans across small to large-sized businesses. The global average in this sector is 25 per cent, and approximately 25 per cent of Ontario’s connections across all sectors are global. The province’s metropolitan areas are also above the international average in global connectivity, behind only London, U.K., the Greater Vancouver Area and Sydney, Australia. In Ontario, there are more than 4.8 million LinkedIn users. The report also broke down which industries could produce the best trade opportunities out of 16 different countries. In the software and IT services sector, India, Brazil and Pakistan showed the most promise. 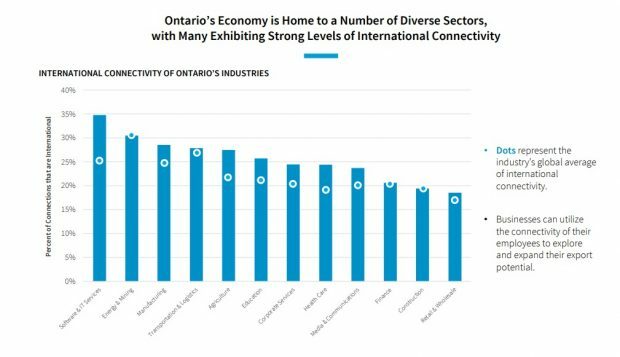 The ministry wants to use the data to “drive export development and trade diversification into untapped markets,” says LinkedIn, adding one of the main reasons Ontario is so globally connected is because of its diversity. “One of Ontario’s greatest advantages that separate the province from the competition is our people – our diverse and innovative talent,” says the report. For most of the top 30 countries that Ontarians are connected to – the top ones being Japan, India and China – many of the connections were initiated by Ontarians. British Columbia is the most internationally connected jurisdiction in North America at 28 per cent.